The acquisition is aimed at making it easier for senior living centers and pharmacy partners to adopt and scale their care strategy. This afternoon senior-focused EHR and health software company PointClickCare Technologies announced that it has acquired post-acute care management company QuickMar. As part of the deal, PointClick Care will control QuickMar’s signature product, the CareSuite Manager. The system includes an EHR and electronic medication administration record (eMAR) that is targeted at post-acute care centers. The system has the ability to manage assessments, care plans, resident billing, behavioral management and charting notes, according to its webpage. The plan is to keep QuickMar as a separate business unit that will offer the CareSuite Manager. The companies say that the deal is expected to make it easier for senior living centers and pharmacy partners to adopt and scale their care strategy, as they can now go through a single company for multiple needs. PointClickCare was founded in 2000 and has been growing over the years. In 2017 it raised $85 million in new funding. At the time, Mike Wessinger, then CEO, hinted at a possible IPO. However, two years later we still haven’t seen this move. While the Ontario-based company is best known for its EHR platform, it also has a number of other products including a skin and wound smartphone app that tracks and documents healing. 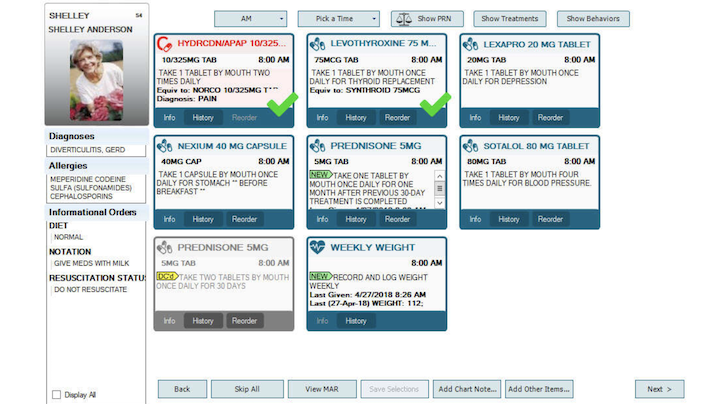 The app can be integrated into a company’s EHR.